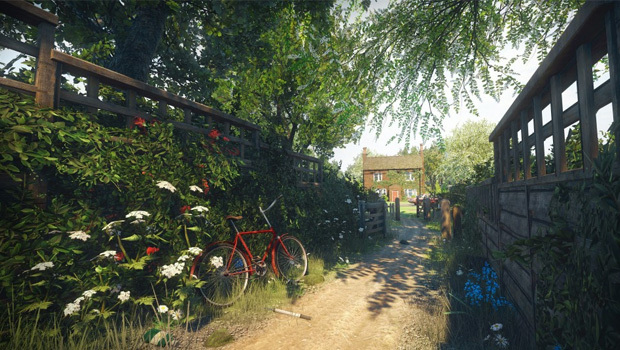 On paper, Everybody’s Gone to the Rapture should be a game that’s exactly up my alley. I like exploration games, I like experimental games, I like games with a strong focus on narrative and worldbuilding. Rapture is all of these things, and yet I found it frustrating and, ultimately, unrewarding. The main reason for this is, I think, its scope. Rapture tells a story that is, by design, complicated and full of interwoven threads. This all unfolds in a non-linear fashion, adding to the complexity. Were Rapture a single-sitting, hour or two-long game (like The Chinese Room’s previous outing, Dear Esther) this approach might work better, but at around five or six hours, that’s not really feasible, for me at least. Having play across multiple sessions made the story even harder to follow, to the point that I couldn’t get invested and struggled to care. This wasn’t helped by worldbuilding that I found hard to get into. The Chinese Room have expertly recreated smalltown Britain – this could almost be Broadchurch: The Game – making the game world picturesque and stunning to look at, but only in short bursts. This is by design, of course, and there’s a lot to be said about Rapture being a criticism of the heavy, non-stop action that is so prevalent. Even so, between the convoluted story, the beautifully dull world, and the expanse of the game, I just couldn’t get into it. Which is a real shame, because there’s a lot that Rapture does really well. This some of the best scriptwriting and voice acting I’ve ever seen in a game; everything sounds natural and authentic, and characters have a vivid sense of personality that comes across solely through their words – you never see anyone as anything more than vague, ghost-like objects. It’s also a technical marvel – I don’t think I’ve ever seen anything quite so lifelike and photorealistic, right down to the minute details. As I said before, there’s a lot to be said for Rapture being a commentary on the state of modern gaming. Slow, deliberate pacing sits on contrast to the rollercoaster rides of most games, and the relative lack of influence you have on the game is significant in a medium that almost always puts the player at the front and centre. Rapture is a work of art for an audience, not a product for a consumer, which is an important distinction and something I think games would do well to pay heed to more often. It’s okay to make the audience feel frustrated or uncomfortable, if that sensation has some sort of purpose, and this is something that Rapture does with grace. Little touches, like forcing you to find map boards rather than giving you a minimap or something you can pull out at will, are frustrating, but its through these that you’re injected into the world. I just wish that there had been something more to hold me there, drag me in, and keep me hooked from start to finish. Everybody’s Gone to the Rapture is developed by The Chinese Room and published by Sony Computer Entertainment, and is available for PlayStation 4 through PlayStation Network. A consumer download version of the game was supplied by PlayStation NZ for this review.